When they appear on the dinner plate, cooked carrots don’t always elicit oohs and aahs. 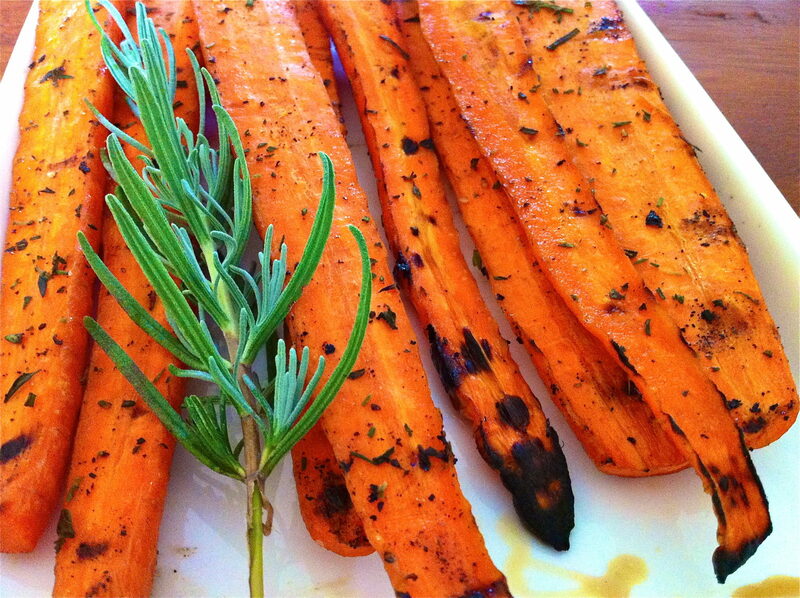 When carrots are grilled or roasted, however, their flavor is enhanced and they don’t become mushy. They are really quite good! I occasionally roast carrots in the winter and love to use my Maple-Dijon Vinaigrette as a marinade. Grilling is another great option which allows for speedy prep and clean-up. What’s more, I always seem to have a bag of carrots in my veggie drawer so it’s an easy, last-minute side that can be grilled alongside whatever protein you may be having. If your carrots are not especially large, you can grill them whole. Toss carrots with the olive oil, vinegar, herbs, and sprinkle with salt and pepper to taste. Grill over medium heat about 15-20 minutes, turning a few times, or until the carrots are cooked to al dente. Exact time will depend on the thickness of the carrots. This looks to be one of our last nights for perfect grilling weather, I have two bunches of carrots in our fridge and I am going to make this tonight. It looks fabulous! You are inspiring me to cook more and my husband loves it! What brand balsamic vinegar do you use & where do you buy it? There are so many brands, & variety of prices, I’m not sure which one to buy. Plus I’ve been told that there are many ‘flavors’ even though the bottle says balsamic vinegar. I need help!! Thanks for any advice! I always buy different brands, sometimes at the grocery store and sometimes at a store in Lancaster called Mandros. You can improve an inexpensive bottle by simmering it until it reduces and becomes thicker. For this recipe, I just used it straight out of the bottle. A thicker vinegar is delicious drizzled on top of a salad or roasted or grilled veggies. Generally speaking, I don’t think you have to spend a lot. I hope this helps! Hi Ann, I finally made this recipe last night and WOW! so perfect! I had to use dried rosemary, but it was still so flavorful and really added to the overall taste. They had the perfect char marks from the gill and I love the kind of smokey flavor they took on.. I am eating some of the leftovers cold with my lunch today. This is a keeper recipe for sure and will make again soon. Thanks for your great feedback, Mary Lou. Dried rosemary is a great option, and I’m so glad this recipe is a keeper! Can I roast these in my oven? If so, what temperature? I always grill these, but if I were to cook the whole carrots in the oven, I’d set the temperature to 375 and roast until crisp-tender. If you try, I hope you enjoy! So happy you liked, Brenda!